If there's any opportunity to encourage a love of reading in children, you'll find me there. Along with Book Week and The Reading Hour, National Simultaneous Storytime is one of my very favourite bookish events for kids. 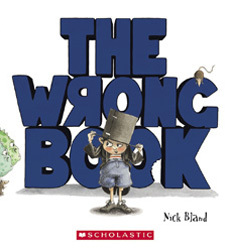 Today at Dickson Library in Canberra, it was a pleasure to read Nick Bland's The Wrong Book to a group of book-loving kiddles. At that every same moment (11am), libraries, schools and homes all over Australia were reading that very same book - how I wish I could have heard all voices in unison. As ever, it's a joy to see children frequent local libraries. Even before setting up for this event, mums with prams and tots were already scouring the bookshelves for some fabulous reads - and what an incredible selection to choose from. I was also thrilled to share my latest Riley book - Riley and the Jumpy Kangaroo: A journey around Canberra - with the kids at this same event. The book is out this August but these lucky kids got a sneak peek at a very jumpy roo and her travels through our nation's capital during our Centenary Year. Warmest thanks to the gorgeous Dickson Library staff, especially Elena and Yamu (that peppermint tea was divine!) and the ever-fabulous Sarah Steed (who is KBR's consultant librarian) for having me along this morning. As I left the library, I was warmed (literally and figuratively by the sight of 75 blankets that have been hand-sewn from thousands upon thousands of knitted bookmarks, created by local knitters in 2012, during the National Year of Reading. This wonderful initiative saw over 4km of bookmarks knitted. The blankets will be given to charity this winter and I was proud to put together a bookmark blanket myself (below). Libraries do much much more than provide books to the community. Share the #morethanbooks hashtag if you're proud of what your local library is doing.